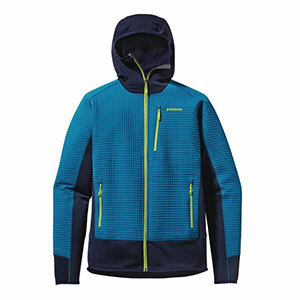 The Patagonia Dual Aspect Hoodie is a technical midlayer for highly aerobic winter activities like climbing and skiing. It's body-mapped, using different fiber technologies in different locations to optimize performance. 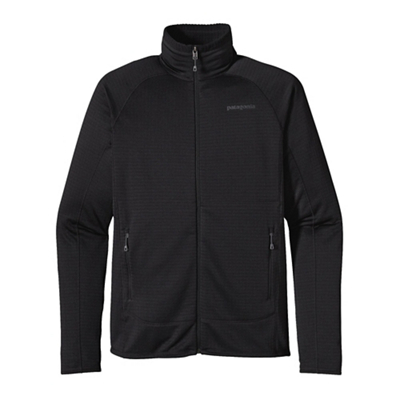 In this case, it's a warm, super-stretchy, and highly breathable Polartec Power Dry fabric on the bottom and top. Polartec Power Shield on middle offers protection, durability, and more warmth retention. The Dual Aspect Hoody is a responsive, not-going-to-get-in-the-way type jacket that can be worn in wide ranging temperatures, conditions, and activities. 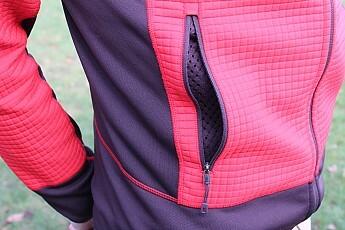 It's just as standout as an outer layer as it is a mid layer. 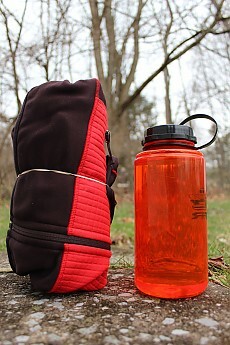 Best use is for activities that require a balance of breathability and warmth (i.e. cool weather hiking or trail riding). Color choices are limited and rather bold (women’s version is a little more toned down in color choice, but still rather limited). I tested this as both a mid layer and an outer layer from early autumn to mid-winter in the mountains and valleys of Central Pennsylvania, and to a lesser extent in the Great Lakes region. The autumn and early winter were unseasonably warm, so a lot of time was spent wearing it as an outer layer. 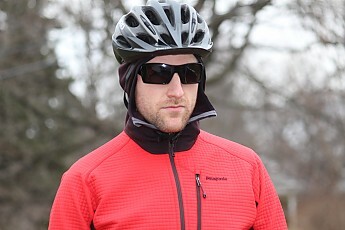 However, during the brisk early mornings and in early to mid January when the temperatures finally dropped, I was able to test it as a mid layer. In all, I wore it in temps ranging from -2°F to 65°F. 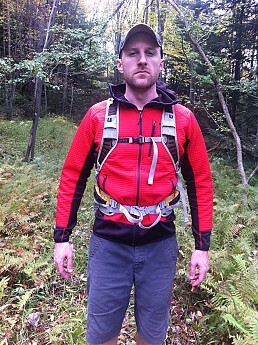 I wore the jacket while hiking, mountain biking, trail riding, and rock wall climbing. 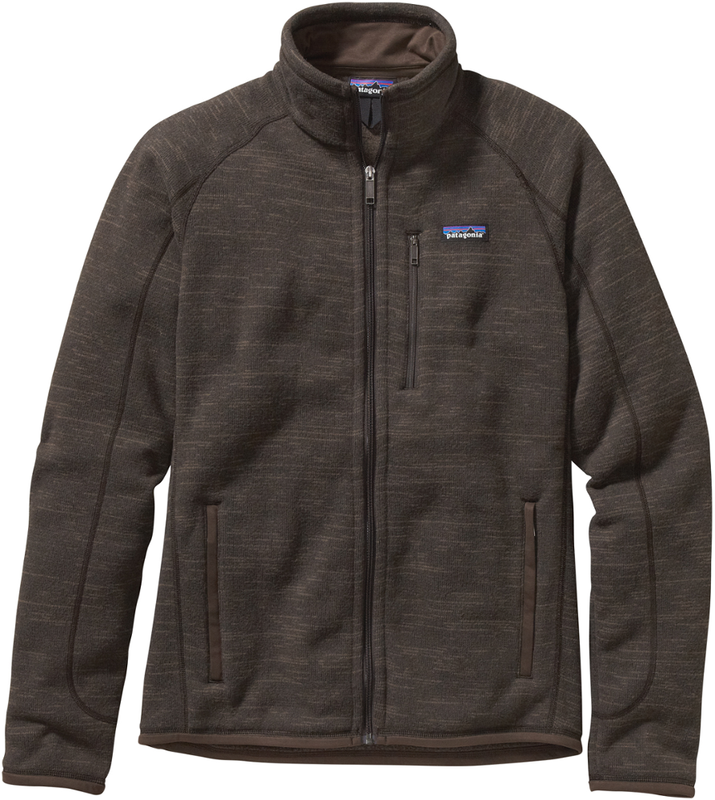 I realize that Patagonia refers to this as a “hoody,” but I prefer to, and from here on out will, refer to it as a “jacket.” A jacket is simply how my mind views this particular garment. The reasons for this are because when I wore it, others would comment that they liked my jacket (never did someone else call it a hoody). 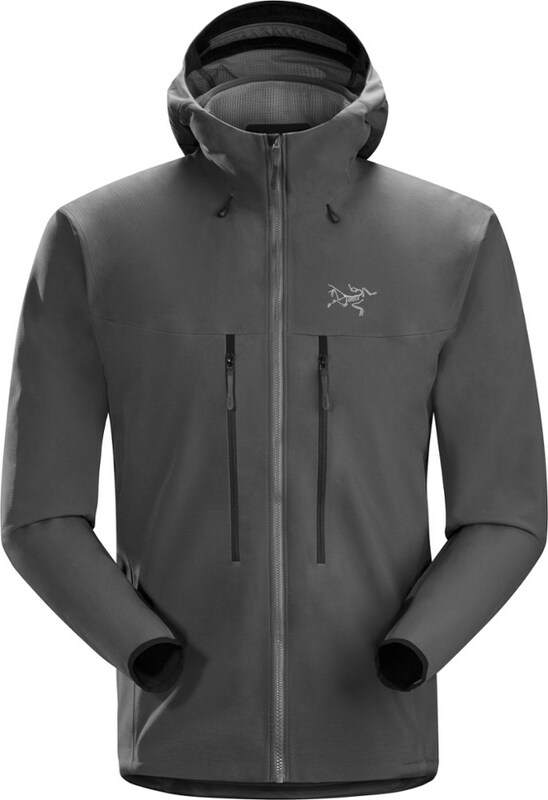 I understand hoodies to typically be zipperless, sans shell, and less technical, and I don’t think “hoody” necessarily gives it the credibility it deserves as a wonderfully executed piece of outdoor gear. 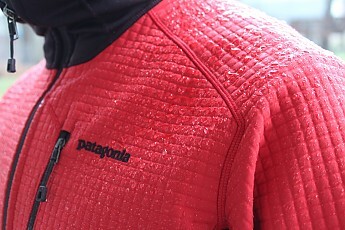 The main feature of this jacket is the combination of fabrics—Polartec Power Dry (brown area, stretchy, breathable) and Polartec Power Shield (red area, shell, weather resistant with a DWR finish. 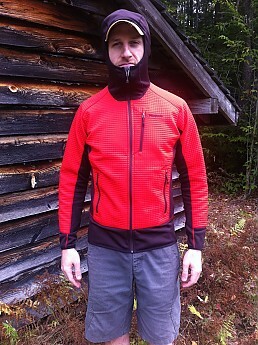 Other features include a balaclava-style hood and waistbelt/harness-friendly high pockets. 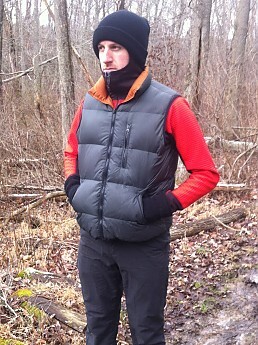 As a slim fit jacket, there is enough room for a base layer and fleece vest underneath, not much more. The arms are moderately tight, meaning they are more responsive to movement and snag less (in fact, no snags yet). Only one long-sleeve layer underneath is doable, although most of the time I chose only short-sleeved shirts underneath. 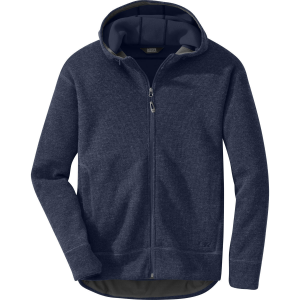 It's comfortable against the skin, especially the brown areas due to a soft fleece interior. When purchasing slim fit tops, I worry about restrictiveness and the feeling of suffocation. No worries with this one. The slim fit is athletic, but not overly tight. In my opinion, I wish all my jackets fit like this one. Note: I’m 6'2", 190 lbs with a 40.5" chest, 16" neck, 34" sleeve. The medium fits true to size when referring to the Patagonia sizing chart. The only adjusting to this jacket is either hood up or hood down, zipped up or unzipped. No cinch cords, no velcro, etc. I see this as a rather sizable advantage over other jackets, pending the jacket fits the user well (fortunately the one for this review does fit well). 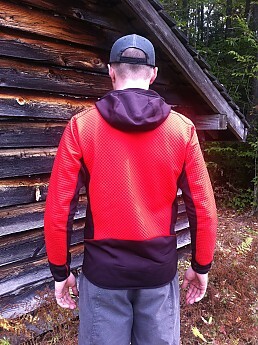 The Polartec Power Shield (red fabric) runs the length of the chest, back, and outer arms, and is a soft-shell like material that is sturdy enough to stand up against the elements, yet light and flexible enough to move well. It has a DWR finish, meaning it withstands some rain, but shouldn’t be considered a rain coat. 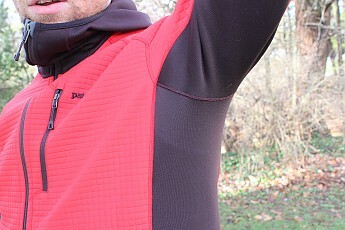 The Polartec Power Dry material (brown fabric) runs the length of the side panels (inner arms and outer torso), wrists, neck and hood, and the waist. This fabric is a very fine fleece material that is breathable, stretchy, and very comfortable, all while maintaining a fair degree of warmth. I thought maybe the hood, when not up, might get in the way of a pack, but this was not the case with either my Osprey Talon 22 or Osprey Atmos 65. A good feel all around. The breathability of this jacket comes in two forms: 1) through the Polartec Power Dry fabric placed in areas most needing breathability, and 2) in the form of unzipping some or all of the jacket. At first, I was hesitant to work up a sweat in this jacket, thinking that the lack of pit zips might cause breathability issues. However, while mountain biking in 50°F weather, I worked up a pretty good sweat and realized that the jacket was breathing just fine (the wind caused by the bike helped, I’m sure). The next weekend, I decided to wear it during the entirety of a 12-mile day hike in 50-55°F, during which I only needed to unzip 1/4 of the way to stay cool. The warmest I have worn the jacket is as an outer layer while hiking a relatively relaxed trail on a 65°F day. At this temp, I started to get pretty warm, even after fully unzipping. It should be noted that in general, my body is warm, be it sleeping, relaxing, or exercising, so I highly value breathability in most apparel. Most of the time I don't wear a jacket above 55°F. Though I’ve worn this jacket in a variety of temperatures and activity levels, in no circumstance have I noticed any interior moisture issues. I assume that is because of the Power Dry fabric doing its job allowing my body to breath. No stench formation. I've washed it three times over the course of the review. 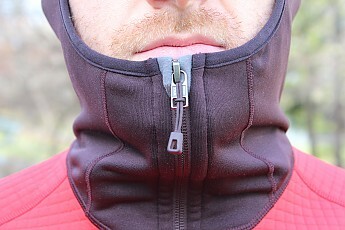 While this is not a winter jacket (at least in areas of considerable winter weather), it is certainly a serviceable layer for winter adventures, especially because of the balaclava-esque hood and the snugness around neck, wrists, and waist that prevent any unwanted chilly drafts. As an outer layer, I’d comfortably recommend temps down to 40-45°F. It can easily go another 10 degrees lower (near freezing temp) if layered with only a vest overtop and/or a warm baselayer, assuming the user will be actively in motion. For the sake of the review, I wanted to take this jacket to the "extreme." I wore it as an outer layer (hood up, winter cap over top, winter mittens, and only a cotton long-sleeve layer underneath) and shoveled the snow out of the driveway (takes approx. 30 minutes) in a blustery -2°F. I am not recommending others do so, but I must say it wasn't as bad as I had anticipated. Although I was cold when I first stepped outside, once I started shoveling I warmed up nicely and was actually rather pleasant. Again, a caveat is that I tend to run slightly warm. As a mid layer, the lowest temp I have worn the jacket in is in 8°F (hood up, fully zipped), winter jacket on top. As an outer layer, I typically wore a short- or long-sleeved polyester or cotton shirt and occasionally a Patagonia Better Sweater Vest (review forthcoming) as an added layer of warmth. I wore it as an outer layer during warmer hiking trips (up to 65°F, but that was pushing it), mountain biking rides, facilitating a high-ropes course, and countless times while strolling through the neighborhood trails. No special attention or detergents are needed for washing. That’s a relief. I washed it three times, each with a normal load of laundry (i.e. cold water, gentle detergents, air dry). I never picked up any overwhelming stench or sweat smells from my use. Although this winter hasn’t given us the amounts of snow we are accustomed to (inches so far, instead of feet), the jacket has seen considerable rain, wind, and to a lesser extent, snow. In conditions as such, it is best used as a mid layer. However, if you are caught in adverse conditions (surprise rainstorm, wind gusts while crossing boulder fields, etc.) it is comforting to know that the jacket won’t totally be useless. With a DWR (durable water repellent) coating, the jacket can handle some rain or snow without soaking through. 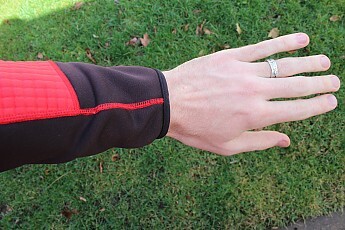 In strong winds, the wind will be felt, especially through the more penetrable Power Dry fabric (brown areas), but will be considerably reduced and there is no threat of the jacket acting as a sail (as many hooded jackets do), due to the tight fitting nature of the hood, sleeves, and waistline. Although I gave this jacket a 5-star rating, it does have a couple of minimal flaws in my eyes. I see a 5-star rating as being defined as an excellent product (which this certainly is) and not necessarily a perfect product (which I have yet to find any piece of gear that is). While the jacket itself is not extremely heavy (very near 1 lb.) nor is it bulky when wearing, it is somewhat bulky when trying to pack. There is no easy way to pack this jacket (no included stuff sack pocket, doesn’t roll up particularly small), and when packed, it takes up a fair amount of room in my pack. This isn’t too big of an issue for me, as I must remember that it is both a mid layer and an outer layer, thus possibly allowing me to bring one less article of clothing to begin with. Jacket rolled with rubber band next to 32oz. widemouth water bottle for size comparison. The other drawback I see with this jacket is the colors that Patagonia has chosen to release. Aside from the red color (French Red), there is also a bright yellow/green option called Peppergrass Green, and a slightly more toned down but still fairly noticeable blue with neon accents called Underwater Blue. While the trend lately in the outdoor and athletic industries seems to be bold, bright colors, Patagonia typically balances this out with at least one black option for many of their jackets. In fact, in the women’s version of this jacket, they do offer a black/gray option. For the men’s version, I would like to see at least one toned down color option of this jacket, maybe in black or more earth tones. I realize this is only personal preferences, but it stems from getting numerous comments from friends and family about how bright the jacket is when I’m wearing it. 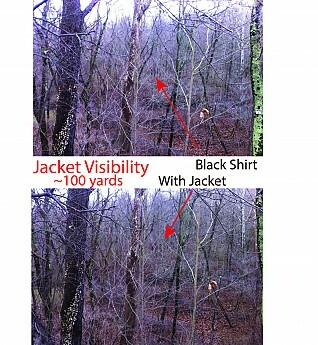 On the other hand, as a hunter and hiker, I realize the benefit of the bright red color, especially while walking in the woods during hunting seasons. In this case, the bright red color may actually be a benefit instead of a drawback, but I'd like to see more options nonetheless. It may be necessary to click to enlarge. Patagonia claims that this is a hybrid jacket, being able to serve as both an outer layer in milder conditions and as a mid layer in cooler temps. From my testing in a range of temperatures (-2°F to 65°F) and in a multitude of conditions (rain, wind, snow), I’d say this jacket accurately supports that claim. 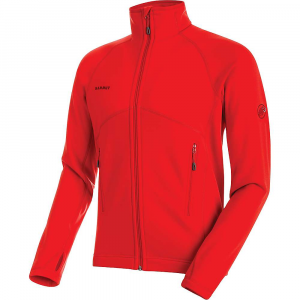 I give this jacket high praises for its ability to meet the needs of the active user in a wide range of temperatures and conditions, either as a mid layer or an outer layer. Its breathability, great fitting seams around the openings (hood, wrists and waistline) and overall responsiveness especially stand out. It's best for cool weather activities including hiking, trail riding, mountain biking, and climbing. 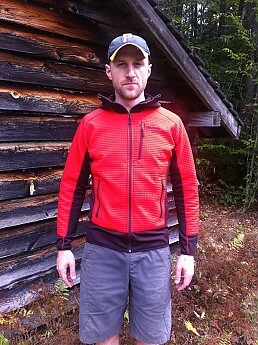 Many thanks to both Trailspace and Patagonia for the opportunity to test this product. Great review, Kiwi! Thanks for taking the time to test out this hoody (sorry...I mean jacket). 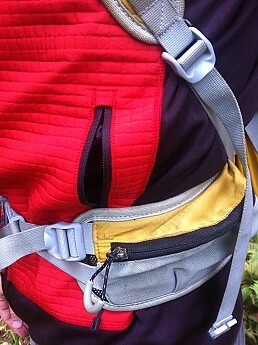 Multi-use gear that's comfortable is a favorite of mine and when I like it, I use it a lot. Great review, Kiwi! Well they don't get the nickname Patagucci for nothing! Loud colors are kinda their game...but man if they don't keep making things I lust after. A fine review! Great review. I've had my eye on this piece and you pretty much answered the questions I had. Just to toss this out there, while I agree that some more muted colors should be available, the brightness that so many manufacturers are going with serves a practical purpose. Much easier to spot in a rescue situation. Again, thanks for this. Excellent review, KK. As always Patagonia's prices are the deterrent for me. Yes, the prices can deter some, however, the quality is top-notch. As my dad always reminds me, "you get what you pay for." As for the colors @TJ, I do see and respect the practical reasons for the bright colors, however, I'd like to see more options available to the consumer. Excellent review, Kiwi. I've been wanting one of these for a long time now and after reading this, I'm convinced I need one, lol. I think it would be great for cold weather snowboarding (under a shell) and winter hiking. I get overheated very easily, so I am glad to hear how breathable this piece is. I agree with you on the men's colors - they are really bold. The women's colors are actually pretty nice! Also, it reminds me of a more durable/heavier version of their R1, which I love. Do you have one of those that you could compare it with? @Ashleigh, I think your assessment is spot on. 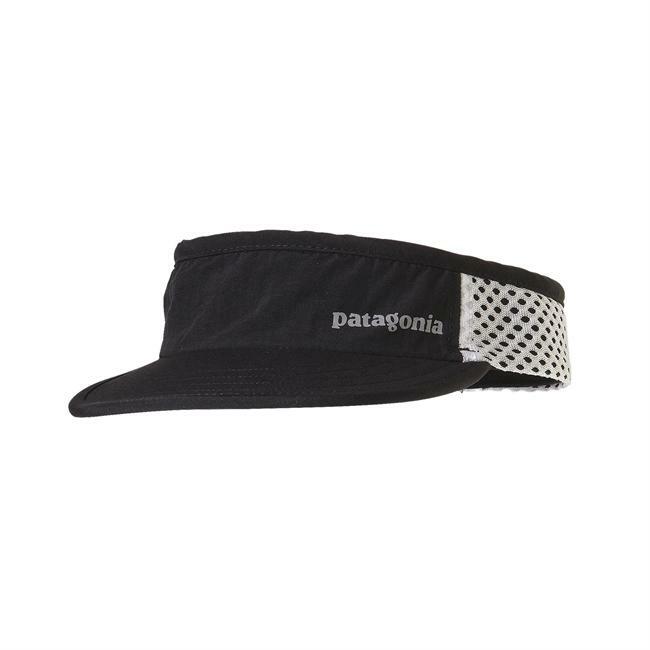 I have no doubts it would serve you very well for snowboarding and winter hiking. This jacket has a fairly wide range of uses. As for the comparison to the R1, I can't give you a a detailed comparison. I've worn an R1 before (I forgot a layer on a weekend trip and had to borrow a friend's R1) but I don't own one. It is certainly more durable/heavier with slightly different features (depending on the R1 model you have). The Dual Aspect will certainly be more weather resistant than an R1. Good jacket, but not worth the money you pay for it. I got this jacker after my R3 was stolen. The R3 I had was high loft Polartec and I used it under a shell with a short sleeve under it during the Canadian winter months. It was heavy but warm and I gave away my down liner that came with the jacket. Reading reviews and knowing Polartec I went with a Double Aspect Hoodie. Up to - 15° it is very comfortable under a leather jacket (not a shell). I still have to test it with a shell. In Europe it is probably OK as winter is like - 5° C, but here in Canada you need a more substantial jacket. I'm talking about walking in the cold and waiting in bus stops, for activities like ice climbing and skiing it might be OK, because of the amount of the activity and heat generation. So be careful. Welcome to Trailspace, Alex. Too bad about someone stealing your R3.